Liquid Pool Covers - NSF Approved, Cost Reducing, Energy Efficient Swimming Pool Product for YOU! An NSF Approved, energy efficient, cost reducing swimming pool product really and truly does exist and can be used in your aquatics facility, regardless of where you live or what your pool is used for. That is the truth! I have found lately that many of the questions I am receiving about Heatsavr is in regards to approval for use by Health Boards, and / or NSF Approval. 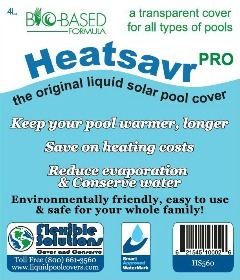 When we first introduced Heatsavr to the commercial swimming pool market over 20 years ago, it was the only product of its kind, and there were no regulations that were required to be met in order to use our product. We had safety data, toxicology reports, and a combination of other materials that vouched for the effectiveness and safety of our liquid pool cover. As legislation in the industry became more and more controlled, however, it was decided that NSF Approval for our liquid pool cover was prudent and should be obtained. To satisfy all NSF requirements, we developed "Heatsavr Pro™." As it turned out, the only thing between the product and NSF Approval was an amended dosage rate, to ensure that the product was safely and adequately metered out throughout a 24 hour period, rather than a single, once-daily dosage. The same amount of product is required to cover the surface of the pool, but now commercial facilities are instructed to split their dosage into smaller, more frequent applications each day. The recommended HS115 Automatic Metering System can be easily programmed to handle this task for facility operators. Directions: For best results, using an Automatic Metering Pump, add 1oz per 4,800 sq ft (approx. 180,000 gallons, based on a 5ft pool depth) every 2 hours. Even if you don't NEED NSF Approval for your customers, sometimes it's just nice to know that it is available. If you have any questions about the safety or effectiveness of HeatsavrTM, or if there is any other way I can help out, please feel welcome to get in touch with me anytime. I look forward to working with you frequently throughout the 2014 season!